← Self-esteem – How to find it? Asking for help – Is it that difficult?. Is life giving us too many headaches? Or have our circumstances dramatically changed for the worse? We say that we are “fine” and that we are in control. But deep down we know we are not. The first step is to admit to ourselves when we actually do need help. So why not try asking for it? If we do not ask, how can we expect to get any advice or assistance? Why asking for help can be difficult. Asking for help is dangerous because actually accepting help is likely to involve our changing something — scary stuff if that sounds uncomfortable. No longer can we pursue easy solutions to the problem like for example engaging in comfort eating or retail therapy. If we do get round to asking for help, it is first useful to be clear what we think we need. Whether we need advice, encouragement, or practical help, we need to ask for it specifically. At the same time, it is sensible to be flexible. What someone offers may be unexpected. Therefore, we need to be ready to explore alternatives. People tend to feel uncomfortable about helping the unprepared or the narrow-minded. This means being willing to listen carefully to what they suggest. I saw a woman walking into a council refuse tip to get rid of a long florescent light tube. She unfortunately tripped over and dropped the tube that exploded in a puff of smoke. It looked and sounded dramatic. Her elderly friend was following on behind and at that moment seeing the prostrate woman and hearing the explosion, she exclaimed `Oh God, God’ and rushed forward. This friend may not have been religious but was she not asking for God’s help without even realising it? Perhaps he did answer her prayer for although she was a bit shocked, the fallen woman got up and dusted herself down. It turned out that she had suffered no injury. 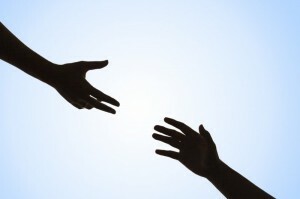 If the help needed is beyond the capability of loved ones or friends, we may decide to ask God for assistance. When desperate, agnostics and even atheists have admitted to trying prayer. After all what had they got to lose? Of course the religious and unreligious alike are all capable of trying to use God like some Father Christmas figure. We can even try bargaining with him. Give me what I want and I will always do this or that for you. The psychologist William James reported on a man called David. This fellow was someone with many problems. His religious worship and pleas for help were in vain. Then it came to him that it was self-interest behind his devotions rather than any respect for the wisdom of God. It was his own happiness and not the will of God that had pre-occupied his heart. He saw he had never done anything for God, only for himself. If we pray only for ourselves how can a God of love for all, hear such prayers? When praying with a sincere heart it is useful to speak specifically about the issues that we require help with. We could then ask God to give us new purpose, a healthier frame of mind in facing our troubles, or more light on how we can better serve our family and community. Perhaps praying is something we have rarely done before. So how can one go about this? Like David, we may feel that God is not answering our prayers. True, we may not be hearing a voice answering but I would suggest there will always be a response. Sometimes we may be unaware of an answer because it is not what we have expected. As we try to pray for help we may realise something about our own attitude e.g. like David that it is too orientated towards self rather than any concern for anyone else. Already the prayer is being responded to without our noticing. If we do ask then we might well get an answer we understand – but this answer may not be what we would have wanted! Actually, many inwardly religious people believe that divine power can spiritually help all people, no matter into what terrible state they have got themselves into. Obstacles to asking for help are false pride and fear of vulnerability. Regarding the latter, it’ll take either a leap of faith or gut instinct to trust someone whom we ask for help. Beingself-reliant is the best option but sometimes, we do need help. We’re not perfect.We”re a only human.Probably part of God’s plan anyway.